24-7PressRelease, online at 24-7PressRelease.com, offers its services in the online press release distribution industry. 24-7PressRelease helps increase your online visibility by distributing your organization or business’ news around the web to journalists, consumers, blogs, and websites. Promote your business, develop your brand, and increase traffic to your website by using 24-7PressRelease. 24-7PressRelease prices its plans to be affordable and respects your privacy, so give it a shot today. Don’t forget to visit RetailSteal.com before you start, for the latest 24-7PressRelease promotions, 24-7PressRelease discounts, and 24-7PressRelease coupons. Rejected press releases are refunded on a case to case basis. Check website for full details. Save $50 on your 24-7 Press Release purchase of SEO & Media Exposure packages when you use this coupon code! Save $50 on your 24-7 Press Release purchase of the $139 Press Release Distribution Package with this coupon code! Enjoy $35 savings on your 24-7 Press Release purchase when you use this promotional code at checkout! Use code at 24-7 Press Release and save $40 on package. Submit one free press release a day at 24-7pressrelease.com. Click link now. Check out 24-7 press release for professional press release packages from as low as $49. Click link. Improve search engine ranking, visibility, and more with the SEO Professional package for $89 from 24-7 Press Release. Click here to find out more. 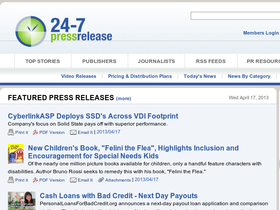 Increase your search engine rankings and drive traffic to your website at 24-7PressRelease.com. Click link to sign up. Click here for the free edition of iContact email marketing. Get started today. At iContact, find affordable plans starting from only $14 per month. Click link now to shop online. At iContact, get a 30-day free trial when you sign up online. Click link to sign up. Get 20% off online at iContact for non-profits only. Click link to save. Sign up for an annual plan on iContact.com and save 15% off the monthly price.